Hot guitar driven blues/rock from the Netherlands. Hot, guitar driven blues/rock from the Netherlands. "JP stands out as not only a musician but in his arranging and production skills also, providing an album with a strong 80's rock feel yet retaining the blues edges, and also one that I think would be well received here in Australia. 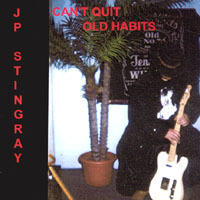 An album that I enjoyed thoroughly, and may I also recommend JP's previous album "Blues Stringer" Go check out JP's website.. and get in touch with him to score a copy of both CD's." Mark "Radar" Watson, Australia's Mr. Blues. very very good, highly reccomend it. I was pleasantly surprised, this is a very good cd, with great guitar work. If you like blues that rock, you cant go wrong. In fact, I ended up ordering about 5 of his cds.